REVIEW NUMBER 2 ANSWERS A1. The LUU-2B/B aircraft parachute flare weighs about 30 pounds. A2. The components of the LUU-2B/B flare are the mechanical timer assembly, the out-of-line igniter, the parachute suspension system, and the case assembly with tamped candle. A3. The minimum drop distance setting of the LUU-2B/B flare is 250 feet. A4. The diameter of the parachute suspension system is 18 feet. A5. At launch, the timer knob is pulled off of the timer by approximately 30 pounds of force on the lanyard. Launching Methods Currently, there are two methods of launching the Mk 25 markerby hand or by sonobuoy launcher. To launch by hand, rotate the base arming plate clockwise to the armed position. Push the base plugs into the battery cavity, located in the marker base, and throw the marker into the water. It functions as previously discussed. If the base plugs (one or both) of a marker are disturbed so the watertight integrity of the battery cavity is compromised and the marker is not launched immediately, a marine marker adapter kit (Mk 34 Mod 0) must be installed. The Mk 34 Mod 0 adapter kit is also used when the marker is launched from sonobuoy launchers. The adapter kit fits over the base end of the marker, and, when properly installed, seals the battery cavity. The adapter kit is installed by rotating the marker base arming plate to the armed position and pushing the base plugs into the battery cavity. Remove the black G-ring and install the adapter kit around the marker base so the seal plugs on the leaf-spring ends cover the holes into the battery cavity. Insert the U-pin to hold the adapter in place. To hand-launch a marker with a Mk 34 adapter kit installed, remove the U-pin and the adapter and throw the marker into the water. 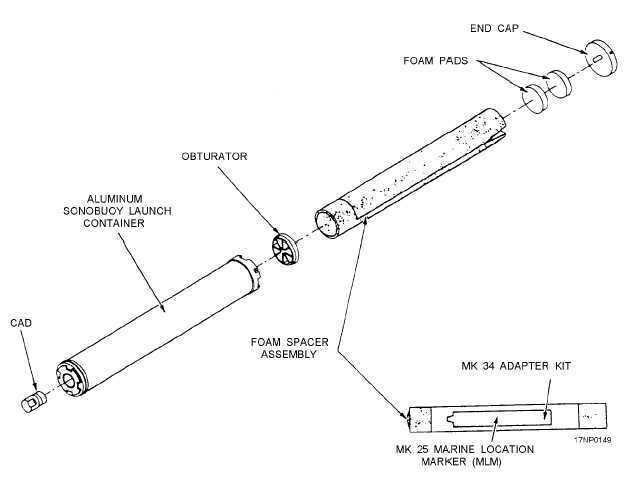 Before launching the Mk 25 marker from sonobuoy launchers, you should install a Mk 34 adapter kit (fig. 4-8) on the marker. The adapter kit provides a safe 4-9 Figure 4-8.Spacer assembly and sonobuoy launch container.